The intergalactic graphic was created by MBA candidate Christian Pearsonusing web-based software and data from the National UFO reporting center. It’s a part of QuantBait, a visualization initiative through which Pearson wants to tell stories about economic, political, and social issues. 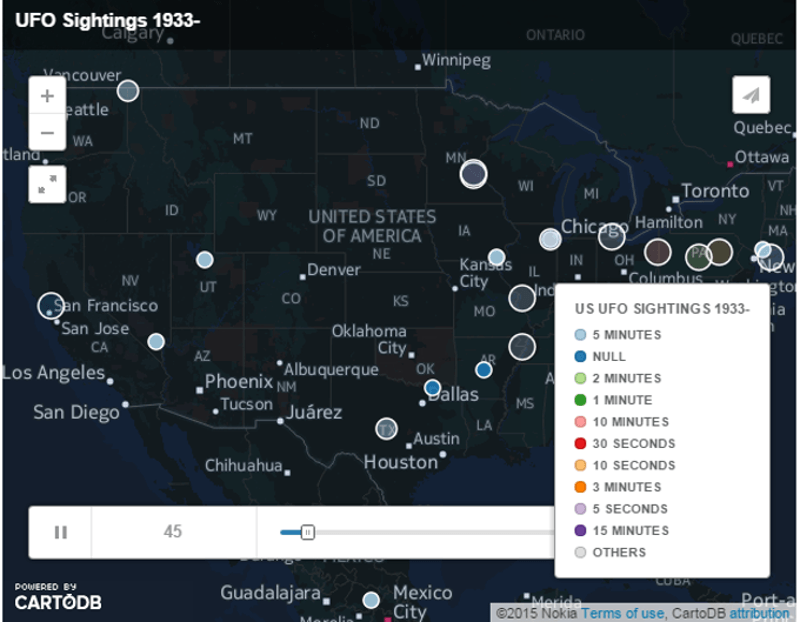 This UFO sighting map “was a fun way of conveying the point that beautiful data visualization can provide deep insights,” Pearson writes via email. When you watch the map closely, you’ll notice that the number of sightings really picks up around the 1950s and 1960s. In the United States, some of them probably correspond with the C.I.A.’s U-2 program, a Cold War air surveillance initiative active from 1954 to 1974. In this program, the C.I.A tested spy aircrafts at Area-51—the secret Nevada facility at the center of several extra-terrestrial conspiracy theories. There’s also better data records of more recent sightings, Pearson says. It’s also evident that the assumption that UFO sightings only happen in isolated, rural areas is mistaken. “The map clearly shows large clusters of reporting in urban areas,” Pearson writes.